Transactional Email Better email delivery for higher ROI. Spend Less. Deliver More. A Powerful suite of features for developers and marketers. 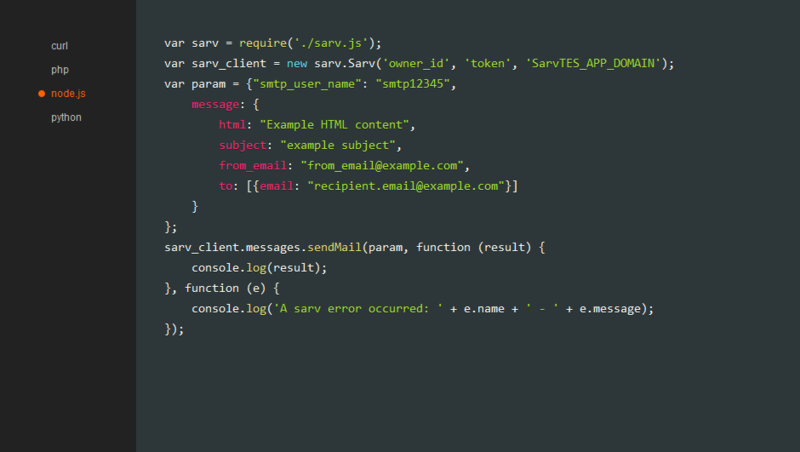 Sarv Transactional Email Service (Sarv TES), Sarv TES is Pay as per the usage of the service with real-time easy access of your statistics like open, click, bounce, delivered, complaints by Dashboard & HTTP API with Webhooks method in JSON data structure. Our tight and seamless integration doesn’t require any plugin or middleware, just choose your integration method and make your emails take off. Our email deliverability pilots monitor your sender reputation, stay on top of latest best practices and work closely with email. Whitelabeling allows to send email with brand, customize sending domain, tracking links and IP address. Custom SPF and DKIM record creation to eliminate domain spoofing and phishing via DMARC records on emails being sent from your domain. We call it Truly Whitelabel because we cover all possibilities by allowing customization of Image Hosting, Tracking Links, Open Tracking Signing Domain, Envelope (Return-Path) & rDNS. API that supports multiple development platforms including Node.js, PHP, Python, Curl with customizable integration approach. 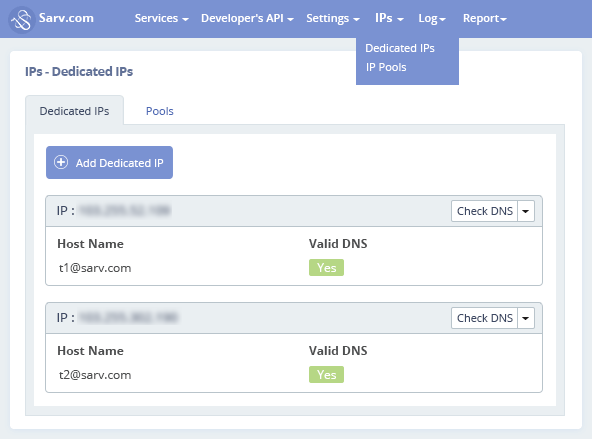 Wide range of options even control IP Routing, Open, Click Tracking & DKIM Authentication via Simple API.  Publicly available Robust Documentation and Support articles. JSON, XML & Get option in both request and response. Another important aspect is that all your basic important information like reputation, current sending speed, sending emails are visible on a single page, so no multiple navigation required. Single platform also allows to access other service platforms with single access details. 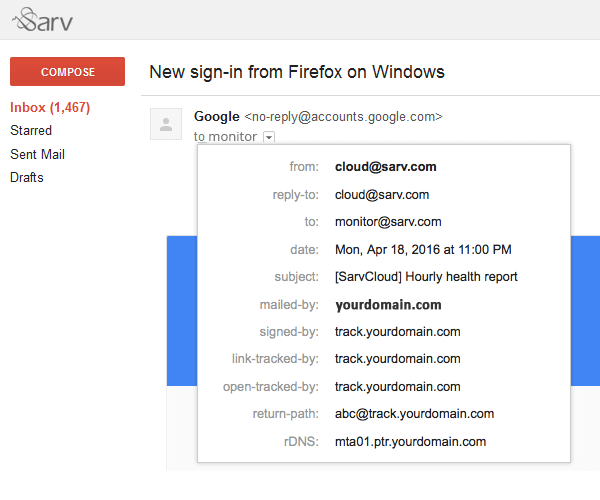 Real-time active like email open, link clicked, bounces & abuse complaints. 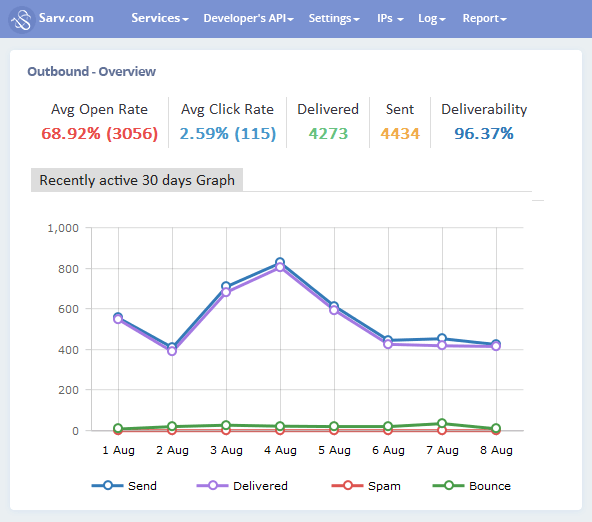 Access all insight into Sarv Dashboard and Event Webhooks. Get the logs of each email with along with Headers, HTML & Text Part. No Extra Cost for advanced feature. Pay only once. No hidden charges applicable. User may decide which slot/type of mail to deliver via which IP. 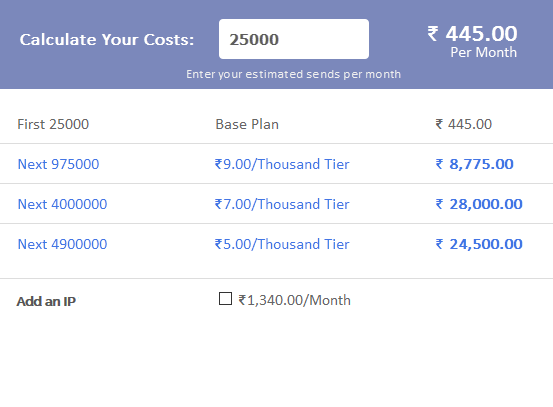 Thus user can maintain a bunch of dedicated IPs and use them separately for separate bunch of mails as per demand. 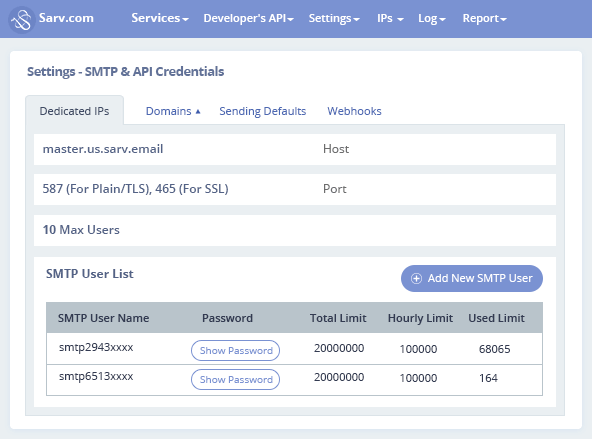 This customization is possible via the API option This customization is also available in managing multiple domains or single domain for each mail. 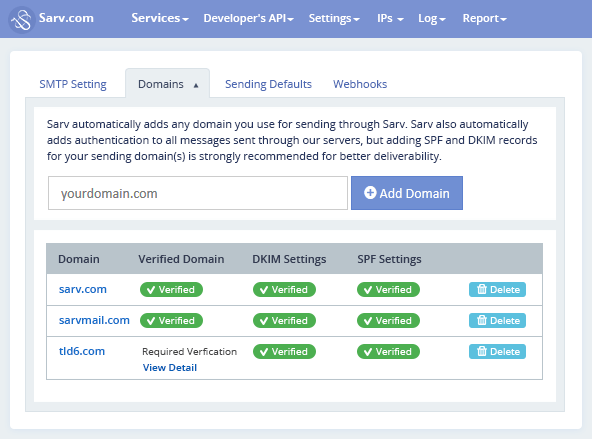 For example, if you want to keep your sender mail, reply mail, DKIM and other records, signed by, mailed by all associated with a single domain then here is the option. Facility to create multiple user accounts under the main account. Sending speed and sending limit can be controlled by admin account. Monitoring the downline account is made easy which helps keeping in check the email sending process of multiple accounts. 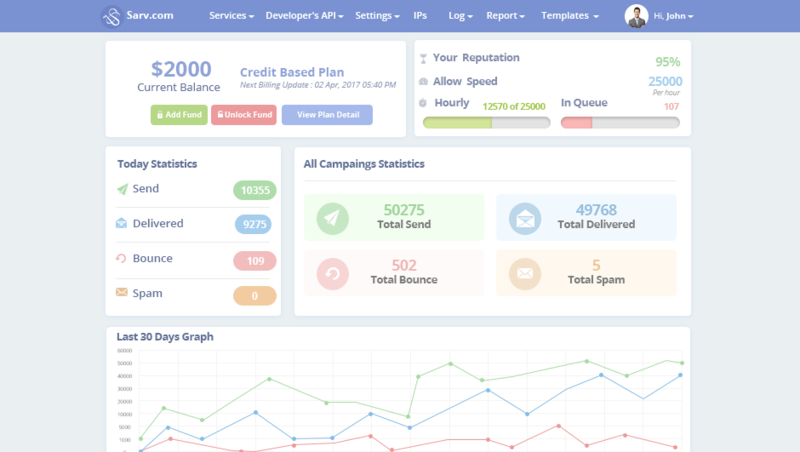 Reputation check, SMTP Settings, Domain Settings and other many default options are given at the dashboard of main account, thus leading to easy management. Mailing sending activities of each user is segregated and so are the reports. Major Mailbox Service Providers (MSPs) like Gmail, Yahoo, Hotmail, AOL & others suggest involving a single domain for each mail for sending, linking and authentication purpose. Thus minimum number of possible domain is One and our system serves this feature of shrinking this domain number to 1. By Whitelabeling user becomes able to customize DKIM, SPF, Link tracking, Open Tracking rDNS, Authentication, envelop and related domain.